Choudhery, M.S., et al. Cord Blood Serum Can Be Used As an Alternative to Fetal Bovine Serum. (2016) J Stem Cell Regen Bio 2(2): 109- 114. © 2017 Choudhery, M.S. This is an Open access article distributed under the terms of Creative Commons Attribution 4.0 International License. Fetal bovine serum (FBS) is a widely used supplement for growth and expansion of stem cells. However, several ethical and scientific issues are related with its use. It is therefore, important to use alternative supplements to support stem cell growth especially for clinical use. The present study aims to evaluate the suitability of cord blood serum (CBS) as an alternative to FBS. 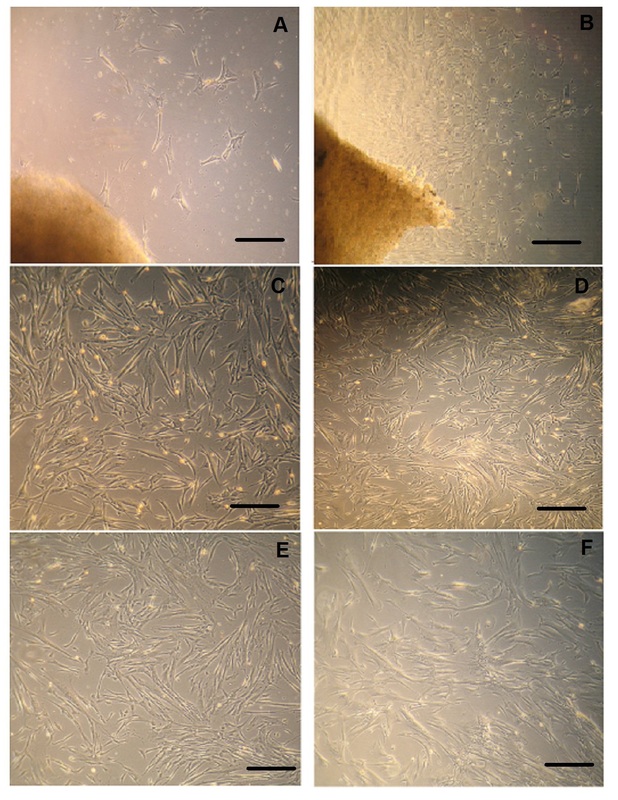 In the current study, Mesenchymal Stem Cells (MSCs) were isolated from cord tissues by explant culture technique and were propagated in complete culture media supplemented with either CBS (CCM-CBS) or FBS (CCM-FBS). MSCs were characterized by fibroblastic morphology and plastic adherent growth. Different parameters such as cell saturation density, number and time of population doublings, and plating efficiency were used to compare growth kinetics of these cells in two types of culture media. In addition, MSCs were differentiated into osteocytes and adipocytes to evaluate the effect of serum on differentiation potential. MSCs cultured in both types of media i.e. CCM-CBS and CCM-FBS showed comparable morphology and plastic adherent properties. However, cells cultured in CCM-CBS showed better growth in cultures as indicated by high number of population doublings, CFUs and saturation density time. Cells cultured in CCM-CBS and CCM-FBS were successfully differentiated into adipopogenic and osteogenic potential. Based on the results of the study, it is concluded that stem cell culture medium can be supplemented with CBS as an alternative to FBS. Recent achievements in the field of tissue engineering and regenerative medicine are very promising. Several hundred preclinical and clinical trials using mesenchymal stem cells (MSCs) are at various stages of completion (see www.clinicaltrials.gov). Although these technological advancements have opened new possibilities for the treatment of various diseases, there are a number of issues still to resolve. For example, requirement of serum for cell culturing and expansion is one such issue. Usually fetal bovine serum (FBS) is used to supplement the stem cell culture medium which is acceptable for research purpose but its use in clinical applications has several limitations including transmission of prions, viral and bacterial diseases. Therefore it is desirable to replace FBS with other suitable supplement to ensure proper cell growth[2,3,4]. Possible serum sources may include umbilical cord blood and peripheral blood. However, it is difficult to obtain serum in large quantities from peripheral blood especially from patients that are undergoing cell based therapies[3,5]. The other possibility might be umbilical cord blood serum (CBS) to use as a substitute of FBS. It is readily available, easy to isolate, lack ethical controversy and free of animal based bacterial and viral pathogens. In addition it is possible to harvest it from patients after screening for major diseases such as HIV, HCV and HBV. Further it will be equally good not only for basic research but also for clinical use. In the current study MSCs were isolated from cord tissue as it is a preferred MSC source for cell based therapies due to volunteer availability in large quantities. Cord tissues have large number of MSCs as compared to other cell sources. MSCs can easily be identified in culture on the basis of their fibroblastic morphology, plastic adherent growth and positive expression of CD44, CD73, CD90 and CD105[3,7]. Further MSCs have immune-modulatory and immune-suppressor properties that make them a good candidate in tissue engineering and regenerative medicine applications. In current study CBS and FBS were compared in terms of their effects on growth characteristics and differentiation potential of stem cells. In the current study, MSCs were isolated from human cord tissue and were characterized using various parameters such as morphology and plastic adherent growth. Further CBS and FBS were compared in terms of their effect on growth characteristics (such as saturation density, number of population doublings, doubling time, and plating efficiency) and differentiation potential (into bone and adipose) of MSCs. MSCs cultured in both types of media showed comparable morphology and plastic adherent properties. Culture media supplemented with CBS showed better growth and differentiation as compared to cells cultured in FBS-medium. This study provides evidence that CBS is suitable for culturing, expansion and maintenance of stem cells differentiation potential and therefore could be used to substitute stem cell culture medium. All samples (cord blood and cord tissues) were collected after informed consent from the delivering mother. The samples were collected from the Lady Aitchison Hospital, Lahore according to the instructions provided by institutional review board at King Edward Medical University. Samples were collected after cesarean births from prescreened mothers (negative for HCV, HBV, diabetes and/or mothers with intra uterine deaths). Cord blood was collected in sterilized container directly from umbilical cord (while it was attached to placenta). Cord blood was placed at room temperature for at least 1 hour in order to complete the process of coagulation. The clotted blood was centrifuged at 1,000 g for 30 minutes at RT (room temperature) and clear serum was collected into new sterile tubes. This procedure was repeated twice in order to eliminate all cellular components from serum. Serum samples collected from several donors were pooled (? 500 ml) to eliminate donor to donor variations. The pooled sera were filtered by passing through 0.45 um filter and then 0.22 um filter. Serum sample were aliquoted in 50 ml falcon tubes at −20°C until use. MSCs were obtained from cord tissue samples by using explant culture method as described previously by Choudhery et al.. Briefly, cord tissue (approximately 2 inches) was washed thoroughly with PBS. After washing, cord tissue pieces were minced using sterilized surgical blades to get small pieces. Minced tissue pieces were mixed properly and were divided equally into two culture flasks. Complete culture medium supplemented with 10% FBS (CCM-FBS) was added to one flask and complete culture medium supplemented with 10% CBS (CCMCBS) was added to other flask. Both types of culture flasks were kept in incubator under the following conditions: 37°C, 5% CO2 and in humidity. After 24 hours medium was vented and respective fresh medium was added in each flask. The medium was changed after every 3 days. When sufficient number of colonies was observed, the tissue pieces were removed along with medium and fresh medium was added. After 10 - 14 days cells were detached using Trypsin-EDTA solution (Hyclone, USA). Cells were counted with a hemocytometer and reseeded as passage 1 (P1). In order to determine growth characteristics of cells (cultured in CCM-FBS and CCM-CM), following parameters were used. Where, cPDs are cumulative population doublings, No is the cell number plated, N is the number of cells harvested, DT is doubling time and CT is the time in culture. Saturation density: The number of cells at cell saturation density was determined as described previously. Briefly, 1000 cells/cm² (passage 1) were re-plated in culture flasks in either CCMCBS or CCM-FBS. The cellswere counted every other day using a hemocytometer. This process was stopped when no further increase in cell number was observed. Differentiation: To assess the effect of serum (CBS and FBS) on differentiation potential of MSCs, they were induced to differentiate into adipocytes and osteocytes. Adipogenesis: Cord tissue derived MSCs cultured in CCMCBS and CCM-FBS were induced to differentiate into adipocytes. Briefly, passage 2 cells were trypsinised and plated in 12 well tissue culture plate at a density of 4000 cells per well and propagated in expansion medium supplemented with either FBS or CBS. When cultures become confluent, adipogenic differentiation medium was added for 3 weeks. Differentiation was assessed using morphological changes and histochemistry using Oil O red stain. 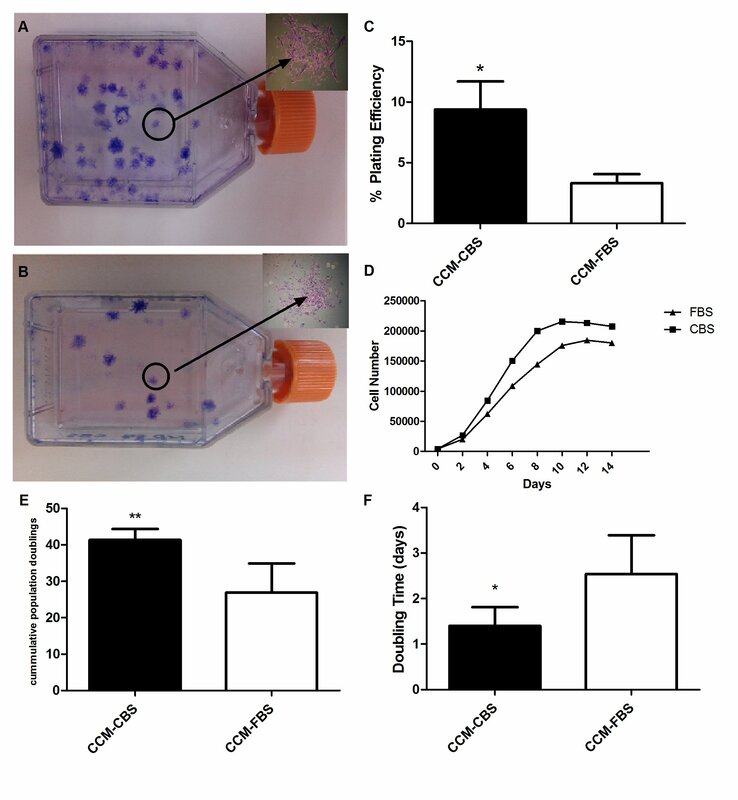 In order to determine osteogenic potential, cells cultured in CCM-FBS and CCM-CBS were treated with osteogenic differentiation medium (at passage 2) as described[5,9]. After trypsinization, 4 x 103 cells were plated in each well of a 12-well plate and respective expansion medium (CCM-FBS or CCMCBS) was added. When cells become confluent osteogenic induction medium was added. Induction medium was replaced with fresh medium every 3 - 5 days and experiments were terminated after 21 days. Oil red O staining: Commercially available oil red O staining kit (IHC WORLD, USA) was used to visualize lipid droplets. Briefly, cells washed with PBS were fixed with 4% formalin and treated with prestain solution for 5 minutes.Oil red O solution was added and cells were incubated incubation at 60°C for 20 minutes followed by washing with 60% isopropanol. The cells were counterstained with a hematoxylin solution for a minute and observed under microscope. Von kossa staining: Von Kossa stain was used for the assessment of osteogenic differentiation in cultures as described previously. Briefly, induced cultures were fixed with formalin (4%) and treated with silver nitrate for 60 min at RT under ultraviolet light. Cells were washed with water, and sodium thiosulfate was used to remove untreated silver nitrate. After counterstaining with nuclear fast red stain, the cells were observed under microscope (ZIESS Primo Vert, Germany). Statistical analysis: Statistical analysis was performed using Graph Pad Prism version 5 (www.graphpad.com). The quantitative variables like plating efficiency, population doublings, doubling time and cell saturation density, and differentiation into adipocytes and osteocytes were presented as mean ± standard deviation. For comparison of two group’s unpaired t-test was used. P value ≤ 0.05 was considered significant. MSCs were successfully isolated from all umbilical cord tissue samples (n = 5 each). After 8 to 10 days cells start to grow out of small umbilical cord tissue segments (Figure 1A). After about 2 weeks, several colonies were observed in culture flask. At this stage the cells grow rapidly and large colonies were observed originating from cord tissue pieces (Figure 1B). The tissue pieces were removed and adherent cells were harvested by using Trypsin EDTA and re-plated as passage 1 for further studies. MSCs cultured in both media i.e. in CCM-CBS and CCM-FBS showed fibroblastic morphology as indicated in figure 1C and figure D, respectively. In addition, at late passages (P10) there was no difference in morphology between MSCs cultured in either CCM-CBS (Figure 1E) or CCM-FBS (Figure 1F). These results thus indicate that MSCs retain their fibroblastic morphology when cultured in CBS. Figure 1: Isolation and expansion of MSC. (A) Explants culture of cord tissue showing outgrowth of MSCs after 1 week of initial culture. (B) Large MSC colonies originating from cord tissue pieces after 14 days. Fibroblastic morphology of MSCs expanded in (C) in CCM-CBS and in CCM-FBS (D). Morphology of MSCs at P10 in CCM-CBS (E) and in CCM-FBS (F) MSCs: mesenchymal stem cells, CT: cord tissue, CCM-CBS: complete culture medium with 10% cord blood serum, CCM-FBS complete culture medium with 10% fetal bovine serum. Plating efficiency was evaluated to determine the colony forming ability of MSCs. Both types of culture media (i.e. CCM-CBS and CCM-FBS) supported the growth of MSCs into colonies as shown in figure 2A and 2B respectively. As indicated in Figure 2C, plating efficiency of MSCs cultured in CCM-CBS was significantly higher (9.380 ± 2.313) as compared to plating efficiency of MSCs cultured in CCM-FBS (3.320 ± 0.741). In order to determine final cell saturation densities, MSCs cultured in either CCM-CBS or CCM-FBS were counted with a hemocytometer on alternative days until no further increase in cell number was observed. The saturation density of MSCs propagated in CCM-CBS was higher (215111 ± 7249) as compared to MSCs cultured in CCM-FBS (184888 ± 10964). In addition, cells cultured in CCM-CBS reached saturation density sooner (day 10) than cells cultured in CCM-FBS (day 12) (Figure 2D). When MSCs attained 80% - 90% confluency, they were trypsinized and serially passaged at a 1:10 dilution in order to determine the time and number of cumulative population doublings. Although both types of media supported growth of MSCs, accumulative number of population doublings was significantly higher in CCM-CBS (41.35 ± 3.00) as compared to cells grown in CCM-FBS (26.90 ± 7.996) (Figure 2E). In contrast, the doubling time was significantly shorter for cells cultured in CCM-CBS (1.402 ± 0.4084 days) as compared to cells propagated in CCM-FBS(2.538 ± 0.8536) (Figure 2F). Figure 2: Growth characteristics of MSCs in complete media supplemented with FBS and CBS. Passage 1 cells were cultured at low numbers for 2 weeks and resultant colonies were stained with 0.1% crystal violet dye. Colonies ?30 cells were counted by using microscope (n = 5). Insets showing individual colonies of MSCs in CCM-CBS and in CCM-FBS, respectively. (C) Graph showing plating efficiency of MSCs cultured in CCM-CBS and CCM-FBS. (D) Cell saturation density of MSCs in CCM-CBS (n = 5) and CCM-FBS (n = 5). Cell saturation density analysis showed that MSCs cultured in CCM-CBS reached confluency earlier than MSCs in CCM-FBS. The number and time of population doublings of MSCs in CCM-CBS (n = 5) and CCM-FBS (n = 5) was compared. MSCs cultured in CCM-CBS showed more population doublings (E) and shorter doubling time (F) as compared to MSCs cultured in CCM-FBS. Values were expressed as mean ± standard error of mean. * p ? 0.05. MSCs: mesenchymal stem cells, CCM-CBS: complete culture medium with 10% cord blood serum, CCM-FBS complete culture medium with 10% fetal bovine serum. The differentiation potential of MSCs cultured in media supplemented with either CCM-CBS or CCM-FBS was evaluated by inducing MSCs into adipose- and bone-like cells. Adipogenic differentiation: Adipogenic differentiation was demonstrated by accumulation of lipid rich vacuoles which were stained positive by oil red O. After induction in adipogenic medium, all cultures of MSCs expanded either in CCM-CBS or CCM-FBS showed differentiation into adipocytes. Although the number of oil red O positive cells was higher in CCM-CBS (58.83 ± 24.96) as compared to MSCs grown in medium supplemented with FBS (56.50 ± 7.93), the difference was not significant (p = 0.83) as shown in Figure 3. Figure 3: Adipogenic differentiation of MSCs in CCM-CBS and CCMFBS. (A) Differentiationof MSCs (n = 5 each) was assessed by oil red O staining of lipid rich vacuoles. A and B showing MSCs cultured in CCM-CBS and CCM-FBS used as control. Although adipogenic differentiation of MSCs was higher in CCM-CBS (C) as compared to MSCs grown in CCM-FBS (D), the difference was not significant (p = 0.83) as shown in E. MSCs: mesenchymal stem cells, CCM-CBS: complete culture medium with 10% cord blood serum, CCM-FBS complete culture medium with 10% fetal bovine serum. Osteogenic differentiation: Cells cultured in both media showed osteogenic differentiation after induction. Cells were treated with osteogenic induction medium for 3 weeks and differentiation was assessed by von Kossa staining. Cells propagated in respective normal media i.e. CCM-CBS and CCM-FBS were used as control (Figure 4A and B). 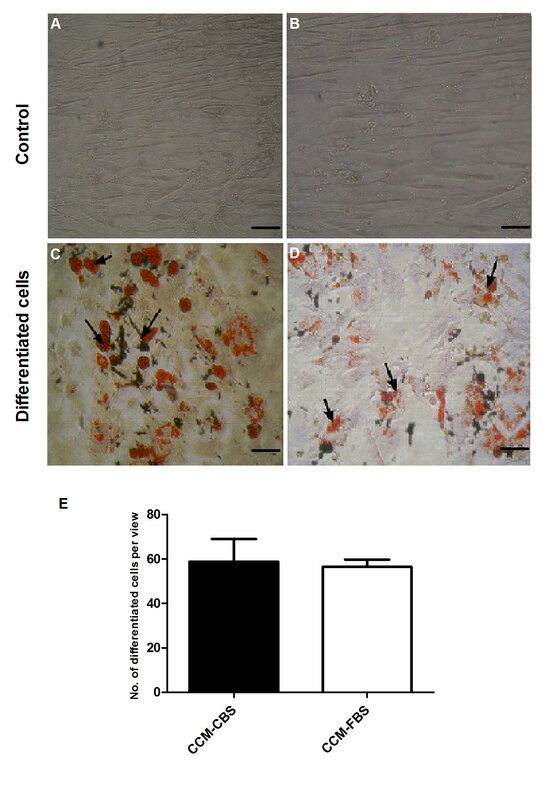 Induced cells showed osteogenic differentiation as indicated in Figure 4C and 4D. Figure 4: Osteogenic differentiation of MSCs in CCM-CBS and CCMFBS. MSCs cultured in CCM-CBS and CCM-FBS were treated with osteogenic induction medium and induced cells were stained with von Kossa staining kit. A and B showing cells in respective expansion medium while C and D represent induced cells in CCM-CBS and CCM-FBS, respectively. MSCs: mesenchymal stem cells, CCM-CBS: complete culture medium with 10% cord blood serum, CCM-FBS complete culture medium with 10% fetal bovine serum. Stem cells are being used for various regenerative medicine applications. Their self-renewal ability and multi-lineage differentiation potential has made it possible to develop engineered tissues and organs in vitro for transplantation, or to regenerate damaged tissues[11,12]. Due to success in the field of tissue engineering and regenerative medicine in recent years, the scientists are hopeful to overcome life threatening human diseases. Currently, there are several preclinical trials investigating the safety of using such modalities for translating stem cell applications to clinics. An important challenge for stem cell applications is the use of serum in stem cell culture medium. Most of the laboratories routinely use FBS as a medium supplement to support and maintain cell growth. However, for clinical applications such supplement cannot be used owing to several problems such as contamination with animal viruses, bacteria, mycoplasma and immunological reactions[14-17]. Therefore use of FBS is a major hurdle in translation of stem cell related research into clinical applications. Because of these reasons it is required to replace FBS with other suitable growth supplements. In the current study, two types of sera (as supplement of stem cell medium) i.e. CBS and FBS were compared in terms of their effects on growth characteristics (population doublings, doubling time, plating efficiency and cell saturation density) and differentiation (into adipocytes and osteocytes) of cord tissue derived MSCs. The effect of serum supplementation was evaluated on MSCs isolated from cord tissues asit is a rich source of cells. MSCs were isolated from cord tissue pieces with anon-enzymatic (explant culture) method as described earlier. The explant culture technique was used as it is efficient, gives pure MSC cultures and is non-expensive as compared to other methods (such as enzymatic digestion methods). This technique of MSC isolation from cord tissues has been used previously by others[19-22]. MSCs were comparable in their morphological characteristics in both types of media (supplemented with CBS and FBS) as indicated by spindle shaped appearance. Interestingly, when cells were cultured for long time (P10) in CCM-CBS, they retained their spindle shaped morphology. In addition MSCs demonstrated plastic adherent growth irrespective of the medium used for culturing of cells. The results of current study are in accordance with other studies that indicate that MSCs exhibit fibroblastic morphology and plastic adherent growth[5,23]. One of the important characteristics of stem cells is their potential to replicate in vitro. The current study has employed several parameters to evaluate proliferative potential of cord tissue derived stem cells. The results of the current study clearly demonstrated that proliferative potential of MSCs expanded in CCM-CBS was higher than those cultured in FBS containing media. The number of population doublings in CCM-CBS was significantly higher (41.35 ± 3.00) as compared to MSCs grown in CCM-FBS (26.90 ± 7.996). Similar findings have been reported in literature, while others studies indicate that there is no effect on growth between cells cultured in CCM-CBS and CCMFBS. Plating efficiency of MSCs in CCM-CBS was higher as compared to MSCs in CCM-FBS. The number and size of colonies was significantly greater in a medium supplemented with CBS. In addition cells cultured in CCM-CBS reached saturation density earlier than cells cultured in CCM-FBS, showing higher proliferative potential of these cells. Cord tissue derived cells have been shown to differentiate into osteocytes, chondrocytes, neurons and other cell types[19,21,24-26]. Majority of these studies have used FBS containing medium for MSC expansion and differentiation. 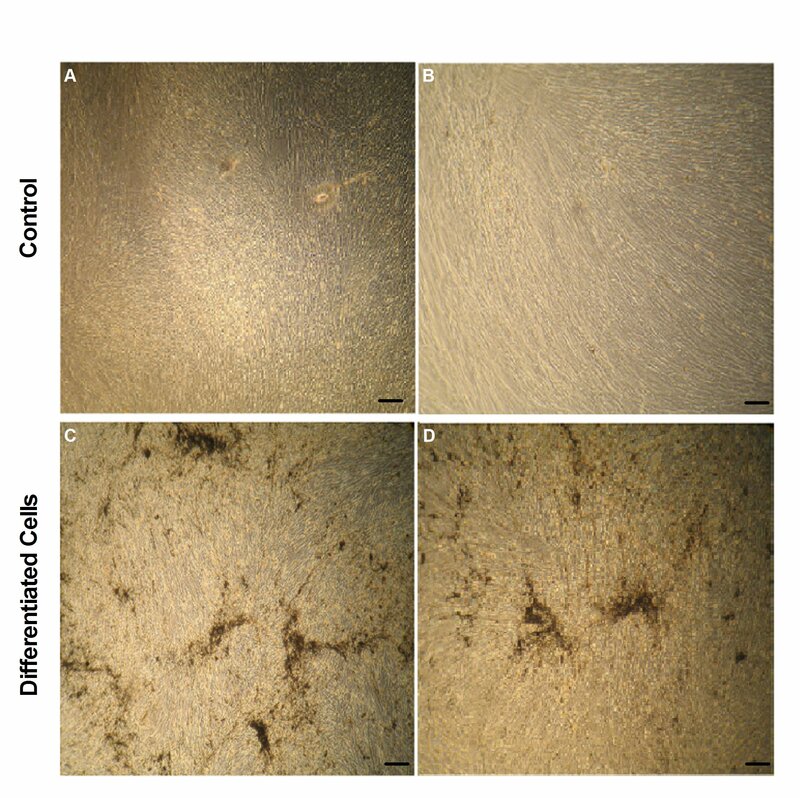 In this study, MSCs cultured in both types of media (CCM-CBS and CCM-FBS) were successfully differentiated into osteocytes and adipocytes as shown by von Kossa and Oil Red O staining, respectively. These results indicated that MSCs can be cultured and differentiated in CBS as efficiently as in FBS containing medium. These results are in line with other studies indicating an alternative to supplement stem cell growth medium. FBS which is normally used as cell culture supplement for growth and expansion of stem cells has economical and scientific drawbacks including contamination with xenogeneic proteins and animal-origin pathogens. Because of these issues MSCs grown in media containing FBS are not suitable for clinical applications. Therefore it is important to investigate alternative culture supplements. In the current study, MSCs were isolated from human cord tissue and were characterized using various parameters such as morphology and plastic adherent growth. Further CBS were compared with FBS in terms of its effect on growth characteristics (population doublings, doubling time, plating efficiency and saturation density) and differentiation potential (into bone and adipose) of MSCs. Results of this study clearly demonstrated that CBS is as good as FBS for proliferation and differentiation of MSCs and can be used as an alternative growth supplement for stem cell culture media. Considering ethical and scientific issues, FBS could be replaced with CBS. Although there are other suitable supplements (such as platelet lysate, peripheral blood plasma etc) for stem cell culture media, CBS is cheap, readily available and involves no ethical issues. Therefore as indicated by the results of this study, CBS can be used in stem cell culture media instead of FBS for better results and safer use for regenerative medicine applications. Authors would like to thank Dr. Farhat Naz, and staff of Lady Aitchison Hospital Lahore for their cooperation in collection of cord blood and cord tissue. 1. Bieback, K., Kinzebach, S., Karagianni, M., et al. Translating research into clinical scale manufacturing of mesenchymal stromal cells. (2010) Stem cells Int. 2. Gul, A., Lone, K.P., Ahmad, A. Implications of umbilical cord blood serum inclinical applications. (2013) the Health 4(4): 71-75. 3. Pérez?Ilzarbe, M., DíezCampelo, M., Aranda, P., et al. Comparison of ex vivo expansion culture conditions of mesenchymal stem cells for human cell therapy. (2009) Transfusion 49(9): 1901-1910. 4. Tekkatte, C., Gunasingh, G.P., Cherian, K., et al. “Humanized” stem cell culture techniques: the animal serum controversy. (2011) Stem Cells Int. 5. Cooper, K., SenMajumdar, A., Viswanathan, C. Derivation, expansion and characterization of clinical grade mesenchymal stem cells from umbilical cord matrix using cord blood serum. (2010) Int J Stem Cells 3(2): 119-128. 6. Nagamura-Inoue, T., He, H. Umbilical cord-derived mesenchymal stem cells: Their advantages and potential clinical utility. (2014) World J Stem Cells 6(2): 195–202. 7. Augello, A., Kurth, T.B., De Bari, C., et al. Mesenchymal stem cells: a perspective from in vitro cultures to in vivo migration and niches. (2010) Eur Cell Mater 20: 121-133. 8. Shi, M., Liu, Z.W., Wang, F.S. Immunomodulatory properties and therapeutic application of mesenchymal stem cells. (2011) Clin Exp Immunol 164(1): 1–8. 9. Choudhery, M.S., Badowski, M., Muise, A., et al. Comparison of human mesenchymal stem cells derived from adipose and cord tissue. (2013) Cytotherapy 15(3): 330-343. 10. Choudhery, M.S., Khan, M., Mahmood, R., et al. Bone marrow derived mesenchymal stem cells from aged mice have reduced wound healing, angiogenesis, proliferation and anti-apoptosis capabilities. (2012) Cell Biol Int 36(8): 747-753. 11. Krause, D.S., Theise, N.D., Collector, M.I., et al. Multi-organ, multi-lineage engraftment by a single bone marrow-derived stem cell. (2001) Cell 105(3): 369-377. 12. Macherla, S., Murahari, N.K. Stem cell therapy-an overview. (2012) International Journal of Pharma and Bio Sciences 3(1): 66-75. 13. Trounson, A., Thakar, R.G., Lomax, G., et al. Clinical trials for stem cell therapies. (2011) BMC medicine 9(1): 52. 14. Hodgson, J. To treat or not to treat: that is the question for serum. (1995) Nat Biotechnol 13(4): 333-343. 15. Jochems, C.E., van der Valk, J.B., Stafleu, F.R., et al. The use of fetal bovine serum: ethical or scientific problem? (2002) Altern Lab Anim 30(2): 219-227. 16. Brunner, D., Frank, J., Appl, H., et al. Serum-free cell culture: the serum-free media interactive online database. (2010) Altex 27(1): 53-62. 17. Phadnis, S.M., Joglekar, M.V., Venkateshan, V., et al. Human umbilical cord blood serum promotes growth, proliferation, as well as differentiation of human bone marrow-derived progenitor cells. (2006) In Vitro Cell Dev Biol Anim 42(10): 283-286. 18. Can, A., Karahuseyinoglu, S. Concise review: human umbilical cord stroma with regard to the source of fetus?derived stem cells. (2007) Stem Cells 25(11): 2886-2895. 19. Romanov, Y.A., Svintsitskaya, V.A., Smirnov, V.N. Searching for alternative sources of postnatal human mesenchymal stem cells: candidate MSC-like cells from umbilical cord. (2003) Stem Cells 21(1): 105-110. 20. Sarugaser, R., Lickorish, D., Baksh, D., et al. Human umbilical cord perivascular (HUCPV) cells: a source of mesenchymal progenitors. (2005) Stem Cells 23(2): 220-229. 21. Secco, M., Zucconi, E., Vieira, N.M., et al. Multipotent stem cells from umbilical cord: cord is richer than blood! (2008) Stem cells 26(1): 146-150. 22. Wang, H.S., Hung, S.C., Peng, S.T., et al. Mesenchymal stem cells in the Wharton's jelly of the human umbilical cord. (2004) Stem Cells 22(7): 1330-1337. 24. Park, S.K., Won, J.H. Usefulness of umbilical cord blood cells in era of hematopoiesis research. (2009) Int J Stem Cells 2(2): 90-96. 25. Baksh, D., Yao, R., Tuan, R,S., et al. Comparison of proliferative and multilineage differentiation potential of human mesenchymal stem cells derived from umbilical cord and bone marrow. (2007) Stem cells 25(6): 1384-1392. 26. Hou, T., Xu, J., Wu, X., et al. Umbilical cord Wharton's Jelly: a new potential cell source of mesenchymal stromal cells for bone tissue engineering. (2009) Tissue Eng Part A 15(9): 2325-2334.